After months of discussing and collaborating (thank you charlene! ), I finally managed to meet up with food bloggers foodoshoot, le petit connoisseur and hungryepicurean. We decided on Canele not only because of their desserts but also because of their amazing 50% off every 2nd main course ordered offer. 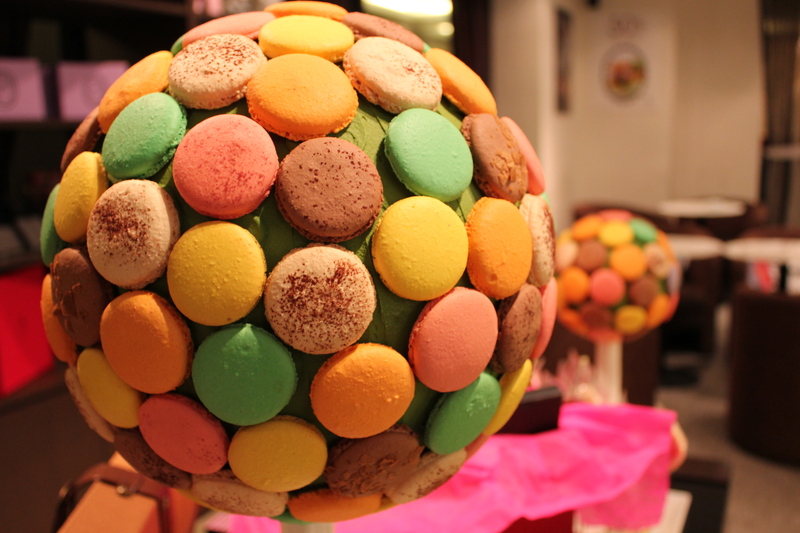 Huge colorful balls of macarons stand atop a table laden with pretty ribboned boxes. I couldn’t resist a photo! 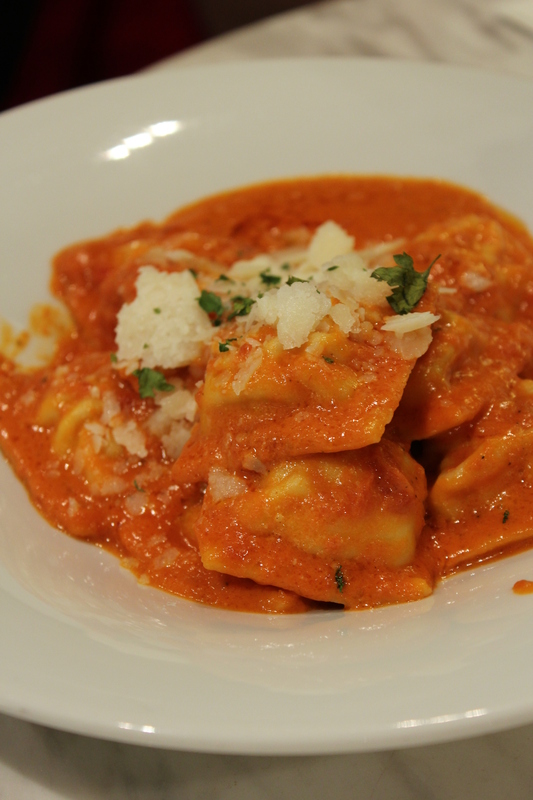 When Glenn’s seafood ravioli came we immediately whipped out our cameras- let the action begin! The plump parcels of homemade ravioli looked enticing especially with the orange hues of tomato sauce and the sprinkle of shaved cheese. You’ll have to read the HungryEpicurean to find out if it tasted as good as it looked. The rest of our main courses soon came in quick succession. I had a savory crepe, sautéed mushroom, paris ham, flambéed with white wine ($14.50). 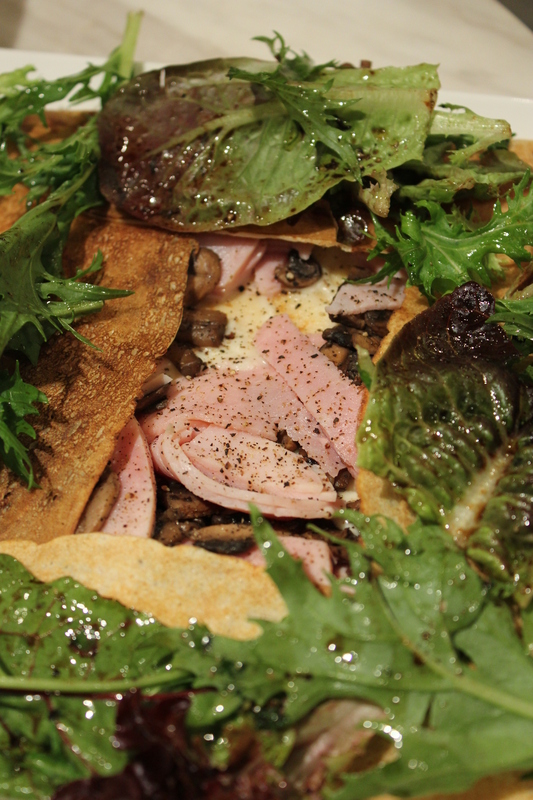 A paper-thin crepe no less, with the earthiness of the mushrooms and the slight saltiness of paris ham and mozarella cheese. I like the fact that the saltiness was mild and not overwhelming which would be what you get from the regular processed ham and cheese. Premium ingredients do make a huge difference, really. While I would have prefered a piping hot crepe( and no, we didn’t take exceedingly long to photograph this, i made sure of that), I recognize the fact that crepes lose their heat really quickly. 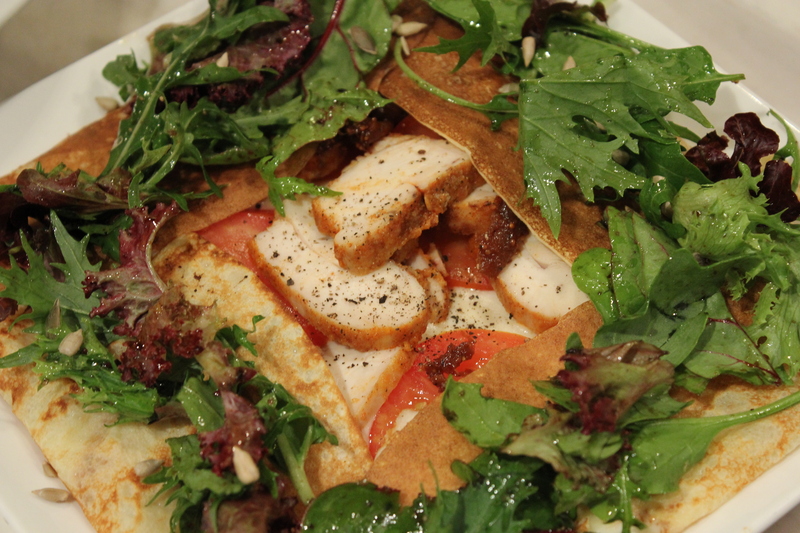 Every munch was a flavourful and satisfying one, without the sort of heaviness you get from rich foods. 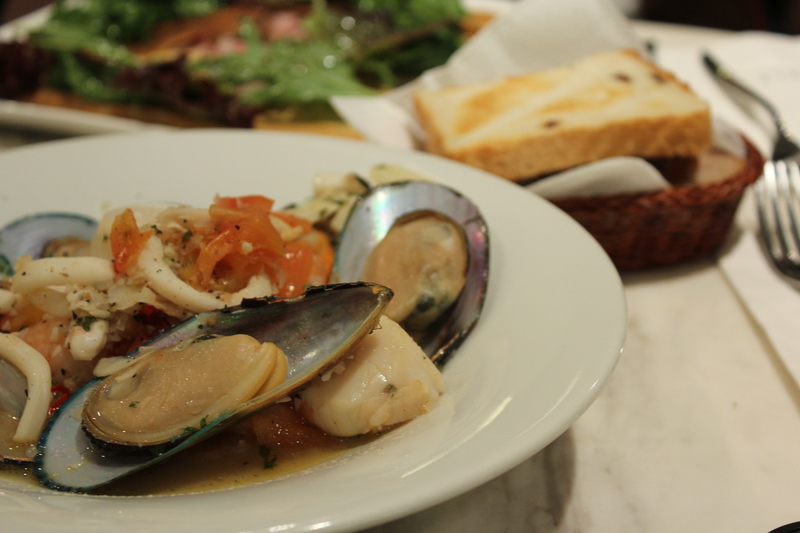 Charlene’s tomato white wine seafood stew ($19) came with either homemade bread or pasta. Charlene picked homemade bread and that would definitely have been my choice too. Jerlin’s roasted chicken, figs compote, tomato, gruyère cheese sauce ($13.50) looked just as impressive as mine. I was initially debating on this because of the figs compote- nothing like a sweet dimension to a savoury main course! People started streaming in as it got later, we had the whole entire place to ourselves at first! I blame my recent disappointment for 1 caramel’s lychee rose cake on L’amour ($8). 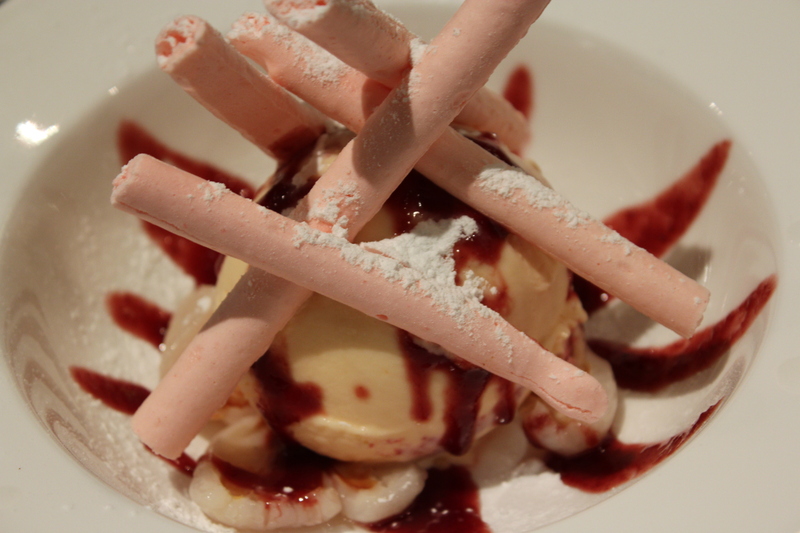 The heady flowery aroma of rose in the rose petal ice cream immediately awoke my senses and no, that’s not all. You get the same aroma wafting up your nose as you crunch on those pink meringue rolls. True to the classic ispahan combination, the raspberry element came in the form of a coulis and the bottom was lined with sliced lychee and crushed almonds. The scoop’s pretty huge so it’s good for sharing. Canele’s dessert certainly did justice to one of pierre herme’s most famous flavour combinations. Every flavour was intense and yet, all so compatible. Perhaps it’s too girly to swallow for guys but yes, Ispahan is my all-time favourite flavour combination. Macha ($7) was well liked by Glenn and Jerlin. 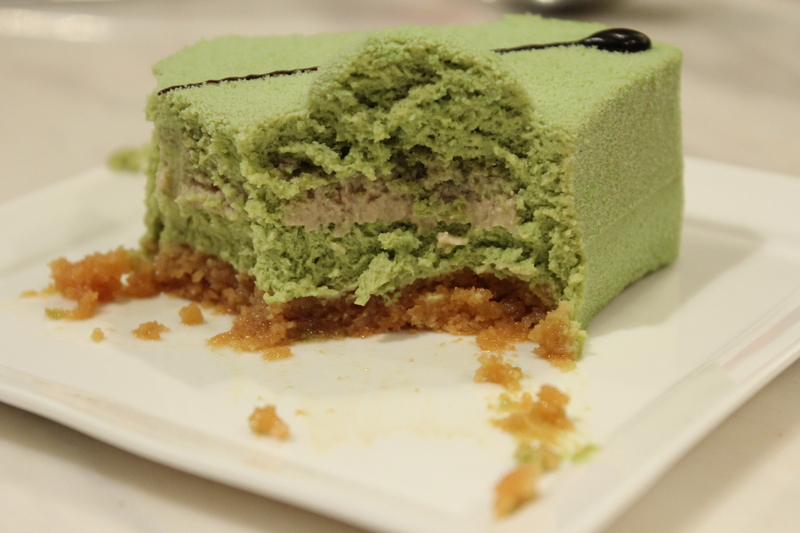 Airy green tea mousse and a layer of chesnut cream, perfect for people who like delicate and light-tasting cakes. The almond crumble at the bottom was far too soggy to be called almond crumble. A crunchier base would make it a more multi-dimensional dessert. The genoise layers were heavily soaked with espresso, making me think it was tiramisu if not for the missing mild cheesy flavour of mascarpone. 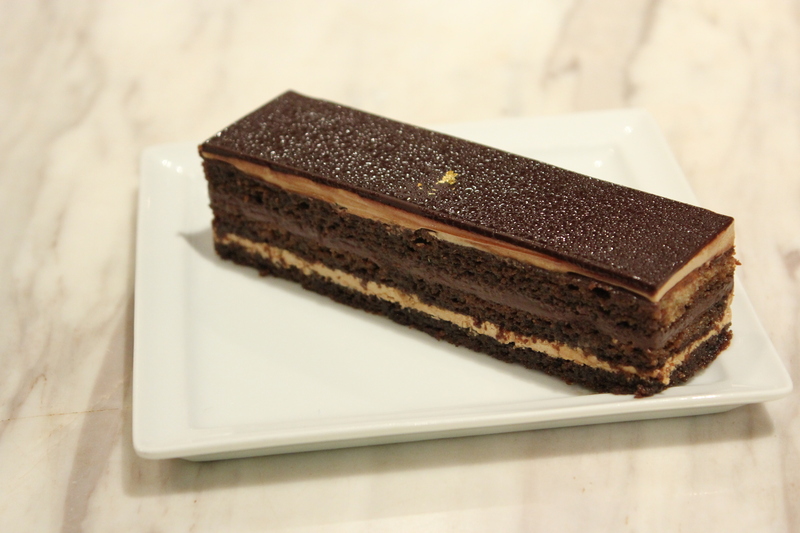 I definitely had better operas before, but I admire the skills of the pastry chef in slicing the ultra-thin layers of cake and the even thickness of each layer. I didn’t get any macarons though I was seriously considering on getting some bonbones. 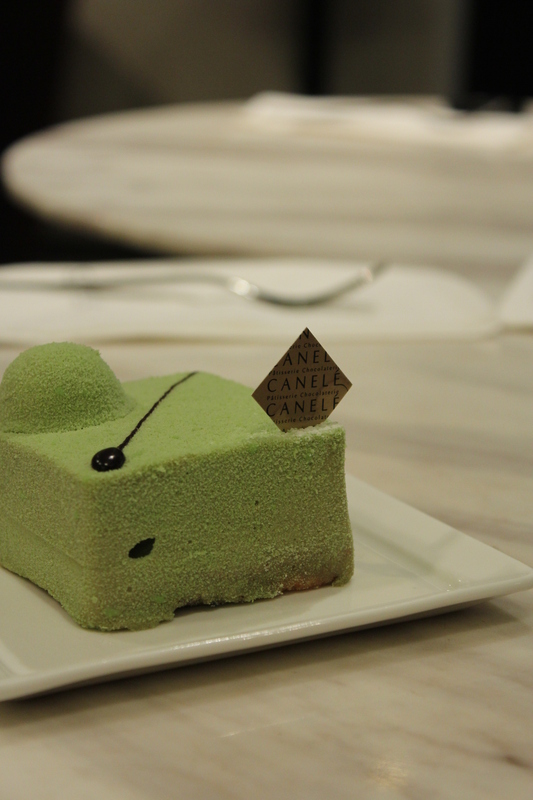 The prices for those little chocolates from canele are so high that I just could not bear to spend the cash. 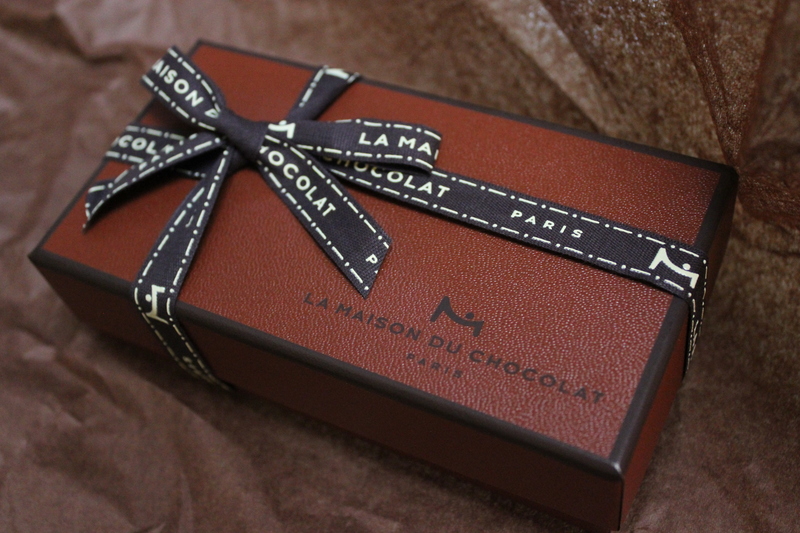 I think the prices are comparable to la maison du chocolat, my favourite institution for fine artisan chocolate. I made a special trip down to the branch in new york. The lengths I go to get my hands on la maison du chocolat! This hefty box (50 US dollars) carries quite a few pieces of chocolate because it has two layers. There are at least 25 pieces of joy inside. The smooth ganache enrobed in the thin layer of dark chocolate (you can choose yourself from the huge variety) made from beans la maison du chocolat sourced on their own are infused with flavours like passionfruit, raspberry, oilves (my absolute favourite and it’s a new flavour from their latest collection) etc. The flavours are so strong that it left me wondering how on earth they did it. Sigh, guess I’ll be surviving on Rittersport 71% for now.